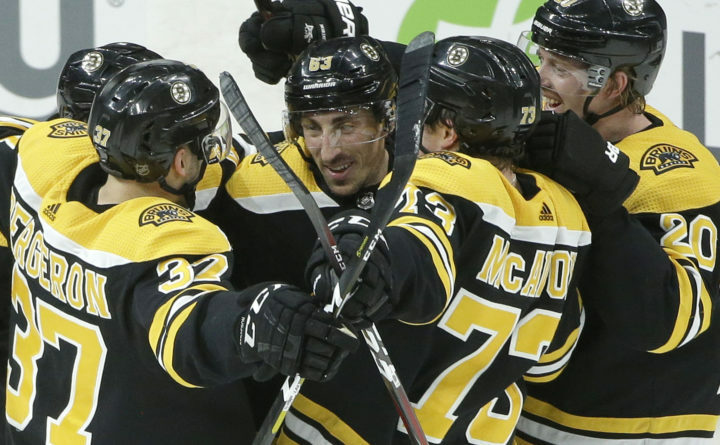 Boston Bruins' Brad Marchand (center) celebrates after scoring the winning goal in overtime with teammates Patrice Bergeron (37), Charlie McAvoy (73) and Joakim Nordstrom (20), of Sweden, against the Colorado Avalanche in Boston on Sunday. Marchand scored 4:03 into the extra period after his shot deflected off an opponent’s skate, extending Boston’s points streak to seven games with a 2-1 victory over the Colorado Avalanche. Patrice Bergeron left the puck at the top of the right circle for Marchand, who skated into the slot and inadvertently used Matt Calvert’s skate to get the puck past goalie Semyon Varlamov. “We got a lucky bounce, and we’ll take it,” Marchand said. “Tonight’s just a wrist shot that happens to hit our guy’s foot and changes direction,” Colorado coach Jared Bednar said. Bednar called his team’s three-game points streak “a huge step forward,” but the sentiment differed inside the Avs’ locker room. MacKinnon gained control of the puck in the corner before charging the net and beating Halak high on the glove side for the game’s first goal with 32.1 seconds left in the first. Boston tied it on Moore’s goal nearly four minutes into the second. The veteran defenseman’s wrist shot from atop the left circle found its way past a screened Varlamov for his third goal of the season. MacKinnon’s perfectly-timed exit from the penalty box during a Bruins power play midway through the period resulted in a breakaway, but he hesitated and jammed the puck against Halak’s blocker. Moore nearly scored another when he dumped the puck into the Avs’ zone, only to have it take a wild bounce off the glass and zip past an unsuspecting Varlamov with 24.1 seconds left in the second. The referees waved it off, saying the puck went out of play after hitting the curved glass next to Boston’s bench. Boston improved to 8-1-2 in the second of back-to-back games this season. Colorado dropped to 3-3-2. … The Avs had won four straight against the Bruins and were 12-2-1 in their previous 15 games in Boston. … Bruins RW David Pastrnak’s seven-game points streak (four goals, seven assists) was snapped. … Avalanche D Ian Cole (upper body) was sidelined a second straight game after his hit on Washington’s Evgeny Kuznetsov on Thursday evoked a bloody fight with Capitals RW Tom Wilson. … Boston D Matt Grzelcyk (lower body) was out for a second straight game but will skate Monday and could return Tuesday against Chicago. … Colorado D Mark Barberio (head) missed his sixth game in a row and C Vladislav Kamenev (shoulder) his 25th. … Bruins D Steven Kampfer re-joined Providence of the AHL on a conditional loan before the game. Avalanche: Host Maple Leafs on Tuesday night. Bruins: Host Blackhawks on Tuesday night.